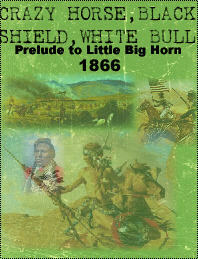 Crazy Horse, Black Shield, White Bull covers the first disaster that befell upon the U.S. Cavalry when attempting to coerce the Indian tribes along the Bozeman Trail. While accounts vary to some degree, the bottom line was that the US forces located at Ft. Kearney were lured out of their secure positions. To do this, the Indians under Red Cloud, first attacked the wood train that had been sent out to gather firewood (it was December, snow and freezing temperatures) which came under attack. A relief force under Lt. Col. Fetterman, consisting of 80 men, was sent out to rescue. Almost immediately after their departure from the fort, a small group of Indians appeared, took a few shots, and fled across the hills. Fetterman, an avid Indian hater, took the bait. 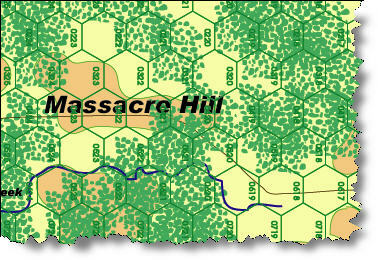 Fetterman and the cavalry continued across the Peno Creek and onto Massacre Hill. By now, it was Noon. It was now that 1000 warriors appeared from seemingly nowhere (they had hid in the wooded areas in the valley and slopes). The cavalry armed with Spencer repeaters, blasted at astonishing rates of fire from as far as 400 yards. Within 15-20 minutes, the 2800 rounds of ammo Fetterman had taken was expended. The infantry armed with Springfield single shots, fired from as far as 600 yards, but like the Spencer’s, soon consumed their ammo. Fetterman was overwhelmed and consumed. The Indians left the 80 men in various forms of mutilation. The focuses on the use of rifles: Spencer, Springfield, and Starr. The game shows their strengths and weaknesses. The Indians armed with some rifles and bow and arrow. Scale is 200 yds a hex, 2-10 men per counter, 10 minute turns. Special rules include random events, unit facing, unit initiative, melee, leaders, ammo consumption, ammo wagons, US relief force, cavalry charges and more! A whole battle using a tactical system!